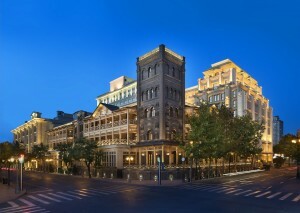 The city of Tianjin presents a mix of the old and new China. Here you will find the Drum Tower and Ancient Culture Street (tourist attraction) and the city centre with all the shopping streets. The centre mainly goes through the Nankai and the Heping area when looking at a map of Tianjin. The north part of Nanjing Road goes through the very centre and Yin Kou Dao is where to get off the subway/metro if you want to be close to central shopping. We recommend this area for singles and couples working in the city and that also wants to be close to shopping and nightlife. Nankai District is south of downtown when looking at a map and is best known for housing Tianjin University and Nankai University, as well as Tianjin’s famous Water Park (Shuishang). This has become a popular area to live for many expatriates in Tianjin. There is a big superstore, Emart, and also other shops and gym nearby. There is also an area called Cheng Gu which is a popular restaurant area. We recommend the Water Park area for people working in Tianjin and also TEDA but wants to live in Tianjin. Meijiang Natural Living Area is located in Hexi District, the south part of Tianjin when looking at a map. This area is the place in Tianjin which the government wants to show as a representational area of Tianjin. It takes about 25 minutes to drive to TEDA and 20 minutes to the very centre of Tianjin. There are more than 15 communities, 3 shopping and amusement areas and therefore it attracts many foreigners to live here. We recommend this area for people working in Tianjin, near the airport but also in TEDA as this area is located in the south of Tianjin. TEDA stands for Tianjin Economic Development Area and is mostly famous for all companies with production located here. It is located approximately 40 km from Tianjin centre. The TEDA area has become more of a living area than before, thanks to many foreign companies located here now. There are some good restaurants, shops and also a big supermarket to shop. If you want more information, visit the website of TEDA which has the Living in TEDA Guide online. http://en.investteda.org/ We recommend this area for people working in TEDA who wants to be close to work. This is only a presentation of apartments and houses that we can offer. Please contact us for more objects and detailed information! If you want to live very convenient in the very heart of Tianjin, City Center and Class Dream are the places to stay! In City Center we have nice, big apartments at the rent between 12 000 – 20 000 RMB/month. City Center and Class Dream are located only 15 min walk from downtown. If you want to live in the heart of Tianjin at lower rent, Fu Li Cheng is a great living area with many locals but also more foreigners moving in. Located very close to Ancient Culture Street and only 5-10 min by subway downtown. Walking distance downtown approx. 30 minutes. If you are a family and wants to live in a house in the very city we can offer beautiful houses in the Gu Lou Area, close to Ancient Culture Street, totally new and with Western Style Furnishing. Located close to Ancient Culture Street and walking distance downtown 30 min/Subway 5-10 min. If you want to live in an area with many foreigners/expats, the Water Park area is where to live! Approximately 20 min by taxi downtown. We can offer apartments from 5 000 – 15 000 RMB/month in the Water Park area. If you want to stay in a more quiet area but still in Tianjin city, Mei Jiang area can offer both apartments and houses. In Swan Lake, Chrystal City, Peninsula Azure Bay and Carmel we can offer nice apartments and houses at rents from 7 000 – 20 000 RMB/month. If you want to live in a quiet area in a big house with garden, the Original County outside Tianjin offers some spacious houses where families with children and pets will have lots of space. We can offer houses at the size of 220 sqm – 500 sqm at the rent of approx. 20 000 – 40 000 RMB/month.